"It is crucial that a poet see when she is not looking — just as she must write when she is not writing," writes Linda Gregg in her essay The Art of Finding. "To write just because the poet wants to write is natural, but to learn to see is a blessing." The sun broke through the June gloom today. As if obeying stage directions, the coastal clouds parted to shine summer solstice bright. 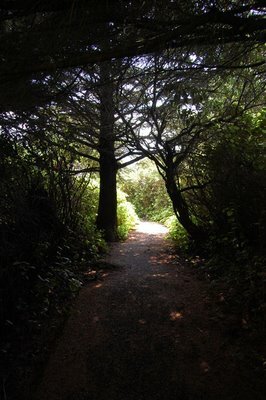 At Cape Perpetua, I walked from forest to sea. As a new season revealed itself, I joined in its vigor. I was bright-eyed at all I had forgotten: chest-high fern, thick skunk cabbage, and tidepools still but lively. I took photo after photo but could not capture the thin salt layer clearing my head, or the lulling traffic of wave after wave meeting rocky shore. Though I had seen so much, I could not convey the change of season, the change in me. On this first day of summer, I'm still learning to see.